With a title like that, I guess I should have looked into a cioppino, but instead, I decided to try my hand at chili. Once again, I went for Gwyneth Paltrow’s My Father’s Daughter, where I’d long ago flagged her recipe for a vegetarian chili. But after looking at it, it just wasn’t resonating. One of the things I love about soup, however, is that a lot of them aren’t an exact science. You can keep basic ratios the same and swap ingredients in and out and still wind up with something delicious. So I started my plotting, and in the meantime, went about looking something up for later in the week in her other book, It’s All Good. I failed to find the swiss chard recipe I was looking for, but I did stumble on a different chili recipe that was tackling the dish with a bunch of the substitutions I’d been planning! 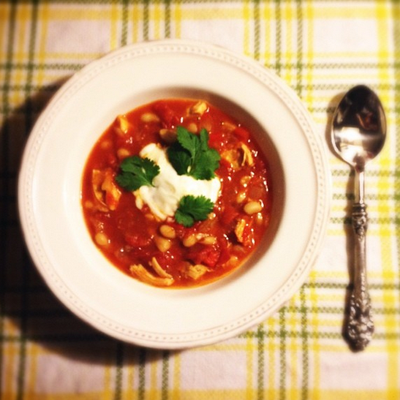 Clearly, it was meant to be: Chicken + White Bean Chili. The recipe was pretty straight forward.. the two main ingredients are right in the title. Add in the standard couple of cans of tomatoes, red bell pepper, onions & garlic (I halved what was asked on the latter two, since as we’ve established, that’s how I roll), along with the usual suspects from the spice rack. With one exception, that is. I shambled from aisle to aisle, slack-jawed and seeking without finding, like the zombies I enjoy so much. What the hell was sweet pimenton? And where could I find it? The folks working at the store were no help and my confused wandering lead me nowhere. Lucky for me, it only took me ten minutes to remember that I had the internet in my pocket. With an assist from my good pals Siri and Google, it was revealed that sweet pimenton is another name for sweet, smoked, spanish paprika, which, as it turns out, was remarkably easy to find. And as it turns out, it was worth the effort. The sweet pimenton had a strong (but not overpowering flavor) and combined with the cannellini beans, and the big, juicy chunks of chicken, it resulted in a chili that felt more Spanish than southwestern in origin. I paired it a 2004 Torre Oria Reserva, a nice Spanish tempranillo, and the whole meal really just came together. I topped it off with yogurt and cilantro, and it may well be my favorite soup so far this season. As for the show, you know, I don’t want to spoil anything. But let me just say, I’m a person who generally watches a show for the main character. I know all the cool kids on the internet are more into the secondary, tertiary, or even quaternary characters (the more obscure the better, in some circles), but if I can’t get attached to the primary, I never get far enough to meet the rest. Buffy, Jack, Rick.. these are my people. These are the characters that make me tune in every week. So when it became apparent that this episode wasn’t going to highlight my boy Grimes, I was definitely dubious. But once again, they knocked it out of the park. The turnover in The Walking Dead showrunners has always been a point of concern for me, but Scott Gimple may just be The One. Big high fives from this camp. Wow, that looks great! I like the image of you shopping like a zombie all slack-jawed. Isn’t it great when the food comes together with a great episode? Best kind of pairing, imho.